Musharrif makes it onto The Shortlist for today, and what immediately stands out to me is that he is very big price, currently around 20/1. He has a useful score of nine, with three sections of green, therefore, it appears he is back racing in favourable conditions for the first time in a while. He has slipped back down to a mark of 75, which has allowed him to enter today's 0-75 handicap, and this was the mark he last won from. Encouragingly this win was also over course and distance on the same going as he will encounter today. Phil Dennis is doing the steering today and will claim a handy five pounds. 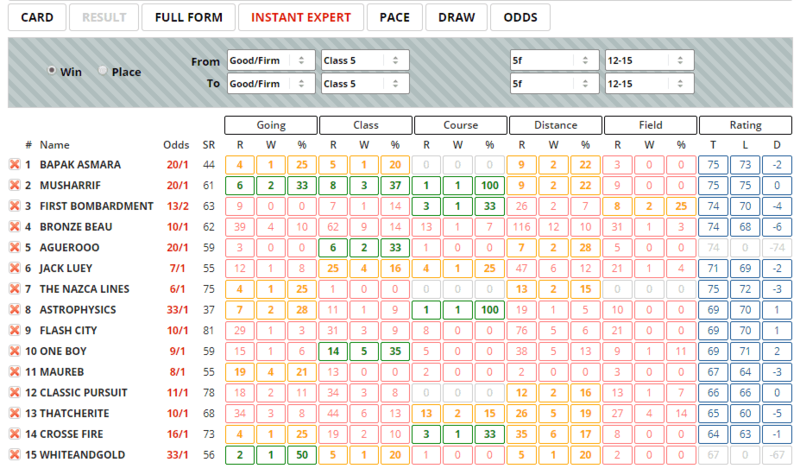 Trainer Declan Carroll has a good strike rate (22.22%) when coming to Beverley, and an Impact Value of 1.90. The Instant Expert report highlights why Musharrif made it to The Shortlist, as there are very few other sections of green, meaning that the remainder of the field is not necessarily that well suited to today's conditions. In truth, this looks quite a poor race and I don't think it will take a lot of winning. Early leaders here over this distance have an extremely good record, with 23.67% of them winning the race, for a level stakes profit of 355.01. The Pace report shows that there is potentially a lot of early pace in this race, with four of five of the field usually very quickly away. Musharrif is one of these, and although he doesn't have a good draw in stall 13 (the Draw report shows that low numbers are favoured), there isn't much pace among the rest of the high numbers so he should be able to get across and grab a prominent position, without wasting too much energy. Musharrif has not been running well, but back down in class in conditions that are likely to suit, I think he is overpriced at 20/1. If he get away quickly like he usually does, then he may prove tough to pass in what looks like a weak race. 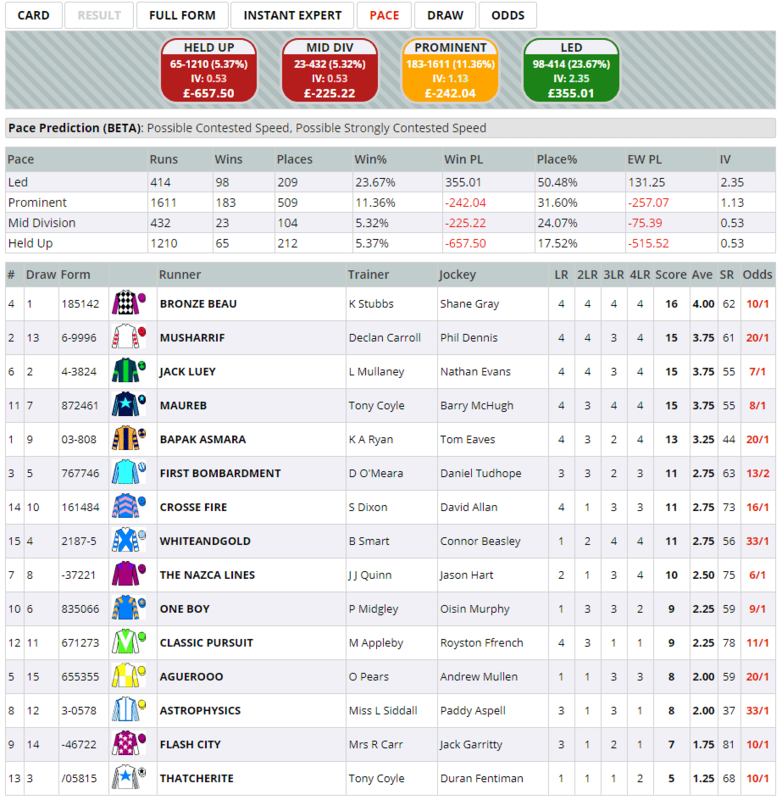 Click here for the 18:55 at Beverley. wow!! what a pick. absolutely bolted up. very well done! Thanks, Paul. It’s always nice to get one of those in! Great work, Steve. Well done, mate. Brilliant stuff, Steve, very well done. Great use of the Gold tools!